Congratulations to the entire Pipeworx team! The company had an outstanding year in safety, and winning the PLH Group Pipeline Company of the year award reinforces the commitment to keeping the team safe. Pipeworx has created a “Safety First” culture which is practiced 24/7 across the entire organization. “Our team worked very hard this year on safety and we thank all of our employees for making safety a top priority, by empowering our workers to think safety on the jobsite, they take the safety culture home and teach their loved ones to be safe in their daily activities. Pipeworx is very excited for 2016 and to continue our quest for Zero incidents” – said Kelly Gillam, President of Pipeworx. Pipeworx finished 2015 with an outstanding Total Recordable Incident Rating (TRIR) of 0.37, which definitely ranks as best in class for the Oil and Gas construction industry. 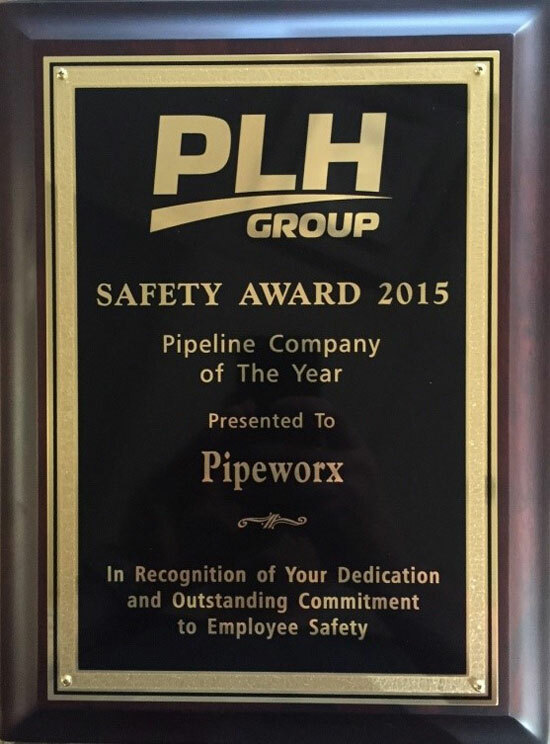 PLH Group congratulates Pipeworx for a job well done in 2015!